During our first year here in Singapore, Paul and I wasn't that knowledgeable yet and we sadly forked out a huge amount of money for a plane ticket on a budget airline. I tell you, the stress of having to fight for the smallest overhead cabin and later having the flight attendant beg you to just have your hand-carry luggage on your lap for 3+ hours was terrifying to say the least. Needless to say, we vowed never to fly budget during the Christmas season ever again. So, on our 2nd year, we planned early and luckily were able to score great tickets via Singapore Airlines. I was really excited for this trip beginning from the plane ride and even for the ride back to Singapore. 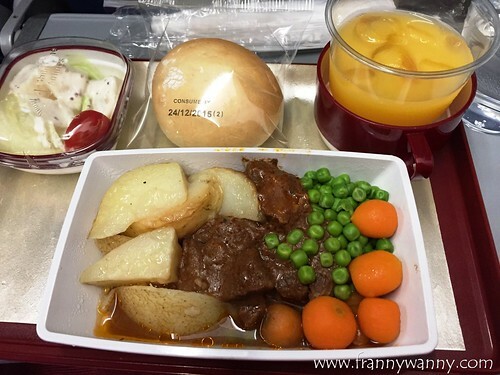 Last Christmas though, we weren't as lucky anymore as Singapore Airlines' tickets soared so high that it shot way past our travel budget and yes, we really try to stick to this. So, after monitoring SQ's airfare for a month, we gave up and went for our 2nd option -- Philippine Airlines. Not that we're not being nationalistic and we don't love our own but Christmas is really the only time in the year when we allow to splurge a little to relax and enjoy the plane ride. Normally, we'd be shuttling back and forth Singapore-Manila on budget airlines. 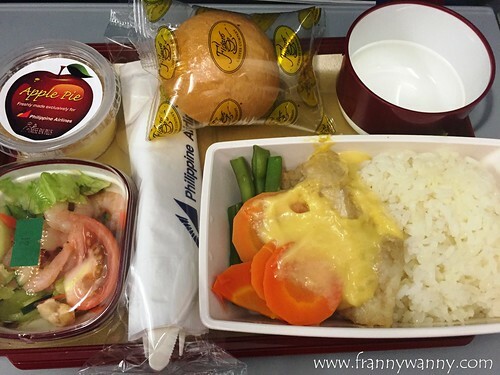 We figured that Philippine Airlines (PAL) would be a good option given that it's a full-service airline which means every passenger will have the following: food, luggage and in-flight entertainment. Well, that's what we thought. As we got closer to the date, we found out that our flight doesn't include in-flight entertainment. If only you know how my heart sank when I heard my colleagues confirmed this. Suddenly, I wasn't so excited for the flight home anymore. :( Well, I really hate long flights so I went prepared. I loaded up my laptop with some movies and this somehow helped me and Paul pass time throughout the flight. Now, let me talk about the food. A bit on the spicy side but quite tasty. I wasn't very hungry so I actually just had a few bites and pushed this aside. It came with a pack of dinner roll (and NO butter) plus some creamy salad that we're not quite sure what it really was. Paul loved it! He said that the beef was very tender and the sauce was good. Somehow he wished it was served with rice instead. For the drinks, you get to choose from the regular sodas, orange/apple juice, wine, beer or water. The options are quite limited and I don't think you can really keep on asking for more as the flight attendants doesn't seem to openly serve drinks all throughout the flight. After our meal trays were taken out, we were surprised to receive a cup of Chocolate Ice Cream each! Woohoo! I think this was the only thing that I enjoyed during this particular trip. 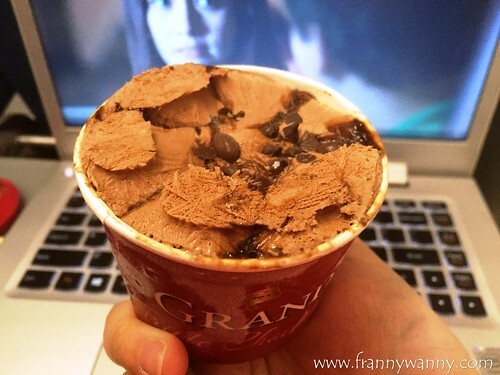 I happily enjoyed my ice cream while watching "A Second Chance" on our laptop. 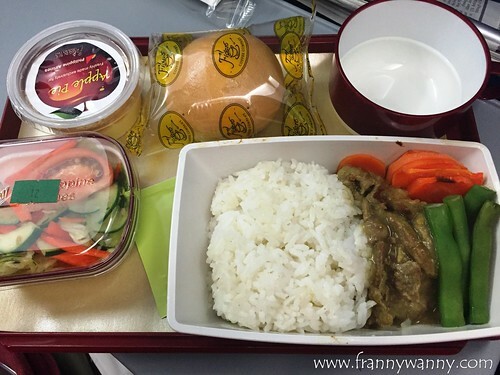 It's funny how much they love serving 'rendang' on board. I was somehow expecting more variety like a pasta dish perhaps or chicken? Paul said it was pretty good though but we don't understand how come the serving is so tiny. Seriously, we quickly consumed our rice in 5 spoonfuls. Oh, I loved this! The fish was delicious and again, I was so sad that the serving was so small. Not very satisfying as I was still hungry even after eating my meal. Once again, they had those bread rolls minus butter. I just find it so odd that they don't serve it with butter as this is pretty much a common pairing, right? The seafood salad was good though and I'm glad that the shrimps were fresh. As for the Apple Pie, it tasted..weird. Wish they gave us ice cream again instead. Aside from the missing in-flight entertainment, I just noticed that the leg room was quite small. Unlike it's full-service airline counterparts, this one has a similar leg room to all the budget planes that we've been taking. 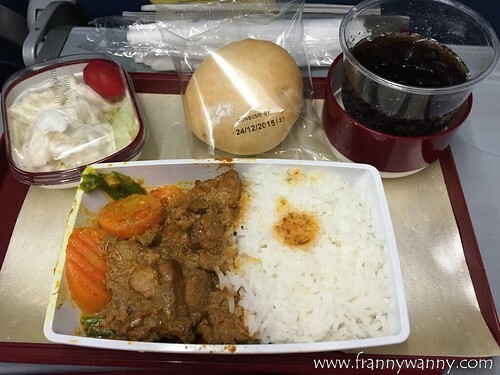 Now, I really am starting to regret paying more than S$500 for budget airline sized plane and a very mediocre meal and service. The experience was very similar to our first holiday trip back to Manila as the overhead cabin space quickly got filled up. Luckily, I got a very smart and strategic husband who immediately zeroed in on the nearest overhead cabin for our hand-carry luggage. Still, how stressful, right? It's really sad as Philippine Airlines is our flagship carrier and clearly, it has a looooong way to go to be at par with the bigger, better airlines. Needless to say, we're crossing this out of our list for our next trips home up until perhaps we'd get better reviews about PAL.